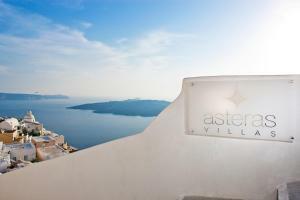 The Asteras Villas is located in the town of Fira, on top of the majestic caldera cliffs. Enjoy views of the endless Aegean Sea. 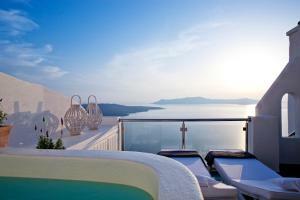 It is only a few steps away from the main gravel street of Fira, the capital of Santorini. The Phoebe suite, decorated in black and white, features a private balcony with armchairs, a table, sunbeds and a heated hot tub with views of the caldera and the sea. The Galatea suite features a covered patio and terrace, which offers a heated hot tub and stunning views. 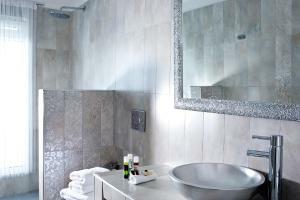 It is equipped with 1 king-size bed, plush cotton linen and a selection of pillows and bedspreads. This suite is decorated in white and features a large 1 bed with white linens, a very luxurious bathroom, a huge patio, a heated spa bath and a very large additional terrace. This restored Santorini-style cave house features a king-size bed with luxurious cotton-rich bed linen and a selection of pillows and bedspreads. This Venetian-style suite features carefully selected contemporary furniture, high ceilings with impressive chandeliers and spectacular views of the caldera, the volcano and the Aegean Sea. In addition, the Astrophelia suite is equipped with a private, heated and outdoor hot tub, which offers views of the caldera and the sea, 1 king-size bed with luxurious cotton-rich bedding and a choice of pillows and bedspreads. La Luna Suite is located a few steps away from the main street. It has a spacious interior, receives natural light and offers views of the caldera and the volcano. It is equipped with 1 king-size bed with luxurious satin cotton bedding and a selection of pillows and bedspreads.